Taiwanese PC maker Asus has added laptop to the forms that its latest Transformer phone-tablet hybrid can adopt—potentially taunting Microsoft and Google once again with the device’s ability to run both Windows and Android. The Transformer Book V combines a 5-inch smartphone running Android 4.4 with a 12.5-inch Windows 8.1 tablet. The smartphone slides into the tablet, enabling it to run the Android operating system. They can also be combined with a keyboard dock, becoming either an Android or Windows PC. To switch between OSes, a user can simply press a button on the device. 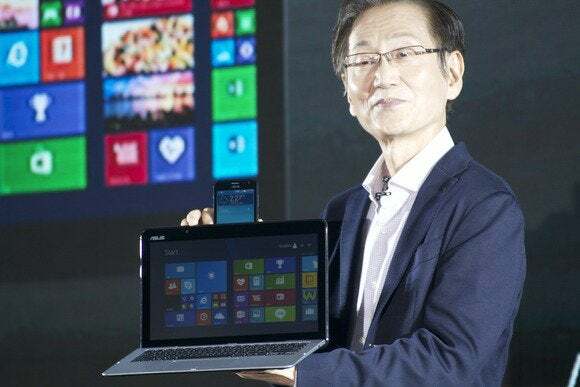 Asus chairman Jonney Shih holding the Asus Tranformer Book V.
Asus showed off the Transformer Book V on Monday, a day before the Computex trade show in Taipei opens. “We love pushing the boundaries,” said Asus Chairman Jonney Shih. The tablet portion has an Intel Core processor, an HD display, and 128 GB of storage. When in laptop mode, the device has up to 1 TB. The smartphone portion has LTE connectivity, and uses an Intel Atom quad-core processor, along with a 2500 mAh battery. The Taiwanese company didn’t say when the device will go on sale, or at what price. It may never reach the market, though: The company reportedly cancelled another Windows-Android hybrid device it unveiled in January, the Transformer Book Duet TD300, because Microsoft and Google disliked the way it could run both operating systems. Shih and an assistant presenting the Transformer Book T300 Chi. On Monday, Asus showed off another Windows PC convertible, called the “Transformer Book T300 Chi.” The 12.5-inch tablet has an attachable keyboard than can turn it into a laptop. The device is 14.3 millimeters thick in laptop mode, and 7.3mm thick as a tablet. It has an unspecified Intel processor, 4G LTE support, and a 2560 by 1440 pixel display. 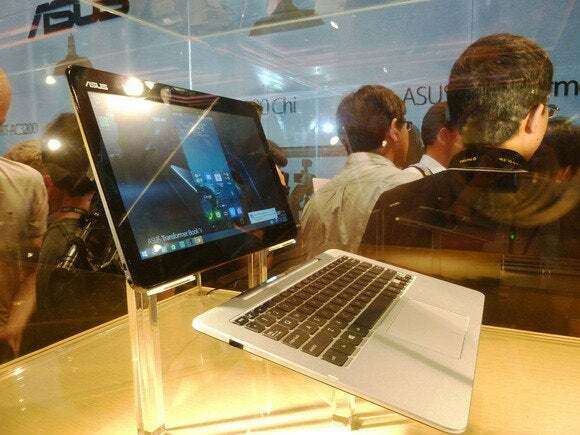 Asus also unveiled some new Android tablets, including 7-inch and 8-inch versions of its MeMO Pad. The larger version, the MeMO Pad 8, weighs 299 grams and is 7.45 mm thick, 10 percent lighter and a hair thinner than Apple’s iPad mini with Retina display. The MeMO 8 has a metal coating, 4G LTE connectivity, and a 1920 by 1200 pixel screen. It uses an Intel Atom quad-core processor, the Z3580, running at 2.3 GHz. The smaller MeMO Pad 7 also uses an Intel Atom quad-core processor, the Z3745, running at up to 1.86 GHz. At 295 grams it weighs less than the 8-inch model, but is slightly thicker at 9.6 mm. Its screen also has a lower resolution, 1280 by 800 pixels. The MeMo Pad 7 will be available in Taiwan starting on June 6. Another tablet shown was the Fonepad 8. It has an Intel Atom quad-core processor, the Z3560, and a 1280 by 800 pixel IPS display. In addition, the tablet is built with 3G connectivity to make phone calls. Asus gave no word on pricing for its products, or when they’ll arrive in markets outside of Taiwan.